The two qualifying teams had all but been decided in Group C while Group D needed late goals to decide who would follow Croatia into the Round of 16. Group C and Group D reached their conclusions today a the 2018 FIFA World Cup and gave the viewers much to talk about after the final whistle. 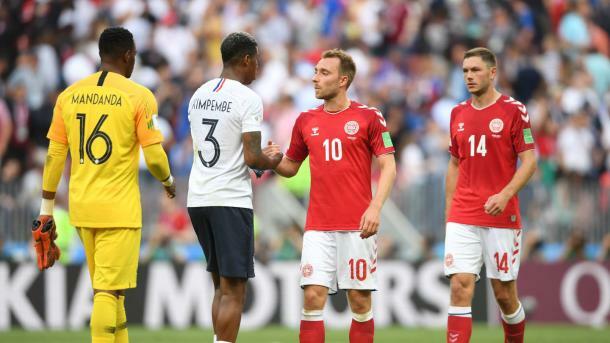 France came into this match already into the next round and therefore fielded a relatively weakened side against Denmark. Denmark themselves only needed at least a draw to make it into the next round and it led to a dreary 0-0 draw between both sides. Christian Eriksen came closest to breking the deadlock on two occassions. The first big chance of the game came to him in the 24th minute after a quick counter by the Danes. It took a solid block by Steve Mandanda and a great tackle by Lucas Hernandez to prevent Eriksen from putting his country ahead. Eriksen then tested Mandanda again in the second half with a long range free-kick but the goalkeeper was able to gather the ball at the second time of asking. Even with the likes of Kylian Mbappé and Antoine Greizmann on the field, France was entirely lethargic in their display today. It made for a dull affair for anyone watching but neither the French nor the Danes will care at all as they are through to the next round. 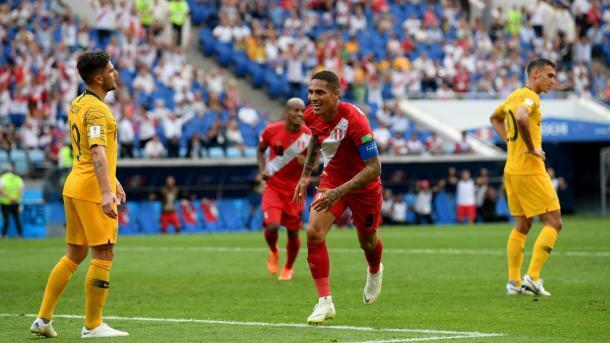 Australia needed a win to make it into the Round of 16 but unfortunately for them, Peru finally found their form in front of goal and downed the Australians by two goals to nil. André Carrillo started things off with a lovely volleyed effort in the 18th minute after Paolo Guerrero had nodded the ball down in an effort to go for goal. Guerrero then made it two in the 50th minute with a finish into the far corner of the net after some good build up play by the Peruvians. Australia had their chances to try and get back into the game but could not find the finishing touch in front of goal. France are through already as previously stated and now Denmark have joined them in the Round of 16. Denmark will face off against Croatia while France have a big game against Argentina to look forward to. Group D posed the most intriguing of storylines today as Argentina, Iceland and Nigeria all still stood a chance of joining Croatia in the next round. Argentina needed a win against Nigeria and for Iceland not to beat what would surely be a weakened Croatian side today and the soccer gods granted their wish. Lionel Messi opened the scoring for the Argentines in the 14th minute when he brought down a great pass from Éver Banega and finished with his right foot past the goalkeeper. Nigeria however, were not deterred and found the equalizer in the 51st minute. 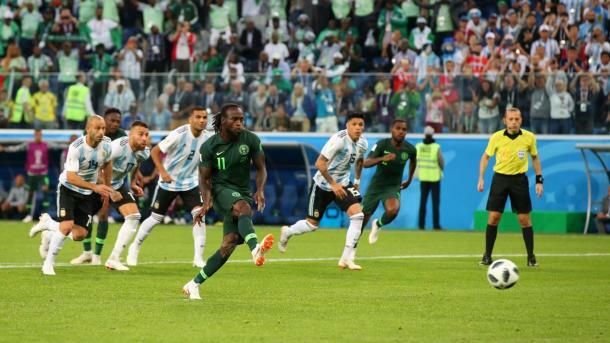 Javier Mascherano was adjudged to have brought down Leon Balogun during a corner kick and Victor Moses cooly dispatched the resulting penalty. Nigeria had their chances after that to finish the game off but didn't take the opportunities presented to them. Instead, it was Argentina that got the final say as unlikely hero Marcus Rojo scored the winning goal in the 86th minute with a first time finish. The other game in Group D saw Iceland trying to find three points against Croatia which would see them through instead of Argentina and/or Nigeria. 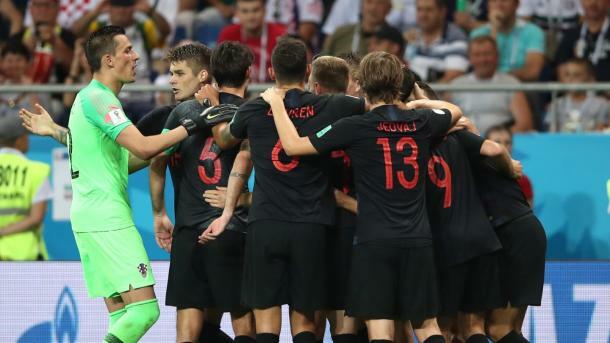 Things did not start well for the tiny nation as Milan Badelj gave Croatia the lead in the 53rd minute of the match after a couple of deflections allowed the ball to fall at his feet inside the box. A 75th minute handball by Dejan Lovren gave Iceland a way back into the match and life in the group once again. Gylfi Sigurðsson converted the penalty and it was game on again in Group D. Croatia were looking to finish the group undefeated and continued to push for a winner which they found in the 90th minute thanks to Ivan Perišić well-struck effort. Not only did it consign Iceland to an early exit from the World Cup but it also insured that Croatia finished the group strongly. Argentina certainly rode their luck today but now they can look forward to facing a France side that, despite topping Group C, were not entirely impressive. Much has been said about the Argentine backroom but if they can some how manage to use this result to propel them forward, someone like Messi could push them all the way to the final. Croatia will go up against Denmark as the heavy favorites and if their form continues into the next round, I can't see any reason to not expect them to make it to the quarter-final stages of the competition.